Hide tasty treats and your dog can start playing with the Dog Brick. Your dog can look for the treats by sliding the different shutters. The game provides fun entertainment for dog and owner. This Nina Ottosson game has been renewed. For example, it now has little boxes that can be moved around instead of sliding shutters. Furthermore, the game comes in a different colour. The wooden Dog Brick is no longer available. The game consists of a playing board with different lanes. There are two sliding shutters in each lane, that can slide independently. Put the treats in the different lanes whilst your pet is looking. Now it is up to your dog to find the treats by sliding the shutters back and forth with its nose or paws. You can also hide treats in the 'boxes'. The Dog Brick has difficulty level two. Please look here for more information about the games of Nina Ottosson. Please note: Suitable for every dog, regardless of age, breed or size. Make sure that this game is always given under constant supervision. The Dog Brick is available in two types. The games made of wood are heavier, making them suitable for enthusiastic and large dogs. 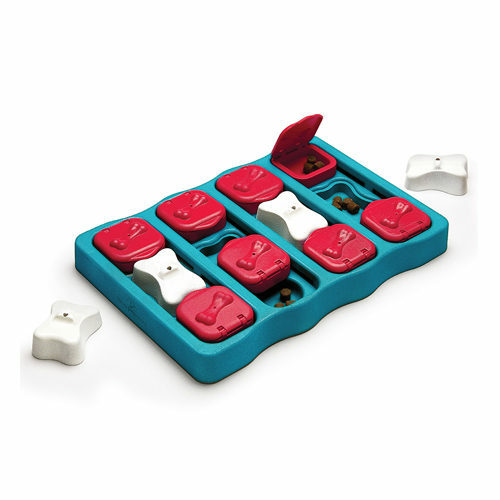 The wooden version is made of certified MDF wood, this wooden game can be cleaned with a wet cloth. The game can be sanded with fine sandpaper after intensive use. The plastic version is made of recycled plastic, which can be easily cleaned with water and soap or put in the dishwasher. After washing up, always check that there is no soap residue left behind. Have you used Nina Ottosson Dog Brick before? Let us know what you think about this product. Great item. Use it for my chihuahua’s food in an average bowl it took him 1 minute to eat his meal. It now takes him 6-8mins to eat a meal and also makes him ‘work’ for his meal as he has to figure how to get to his food. Definitely recommend. Our Labrador pup gets very excited when the dog brick game comes out. He thoroughly enjoys finding pieces of food. An excellent way of exercising his mind and coordination AND making his food ration go further! Cannot recommend highly enough. Superb design and robust. Brilliant! Great to watch. My border collie loves this puzzle. Arrived very promptly & in good condition. Easy to use & keep clean. She managed to get the lids off some of the boxes but they click back in quite easily - although they're showing signs of her teeth marks. 2nd time I've used Vetsend & I would definitely order from them again. I wasn’t sure how my dog would get along with this, seeing as she’s as subtle as a - well - brick. Decided to fill it up and see how she did with it. As predicted, she went bezerk and there were red lids flying everywhere!! ???? So used lower value treats and broke it down into steps. She still won’t pick the bones up with her teeth but paws frantically until they flip. But she loves it her tail wags the whole time and she leaps around in excitement when I’m loading it up. A good buy for some fun, interaction and nose/brain work when I’m working from home and woof is a bit bored. My cockatoo never says no to a few treats but it only took him about a minute to remove all the treats hidden in this game. He soon realised that to get the treats from underneath the sliders he had to remove the white bones first. He does like playing this game but wish it was a bit harder for him.